Welcome to our complete guide to the Patterdale Terrier? Thinking of bringing a new puppy into your life, or want to find out more about your beloved pet – then join us as we take an in-depth look at this charismatic pooch. If you have been looking for the perfect furry companion, then you may already know that science has a lot to say about canines. In fact, researchers have known for over 30 years that the mere act of petting a dog can lower the blood pressure, slow the heart rate, calm the breathing and relax the muscles. If you are ready to start embracing the calm that a dog can bring to your life as well as the lowering of stress hormones, then you may find yourself hemming and hawing over the exact breed. If smaller dogs are more your speed, then a Patterdale Terrier may be just what your heart desires. Keep reading to learn a little bit more about this adorable breed of dog. What Is A Patterdale Terrier? The Patterdale Terrier or the Black Fell Terrier, is an English dog breed. This means the dogs originated in England, along with other terriers including the Airedale Terrier, Lucas Terrier, and the Smooth Fox Terrier. The dogs are small and the word terrier comes from “tere,” which means earth. Earth refers to the original function of the dogs and how they were used to catch vermin. Specifically, the terriers were used to hunt down foxes and force them out of their dens. Their small and wiry nature made them useful and much more agile than larger hunting dogs. 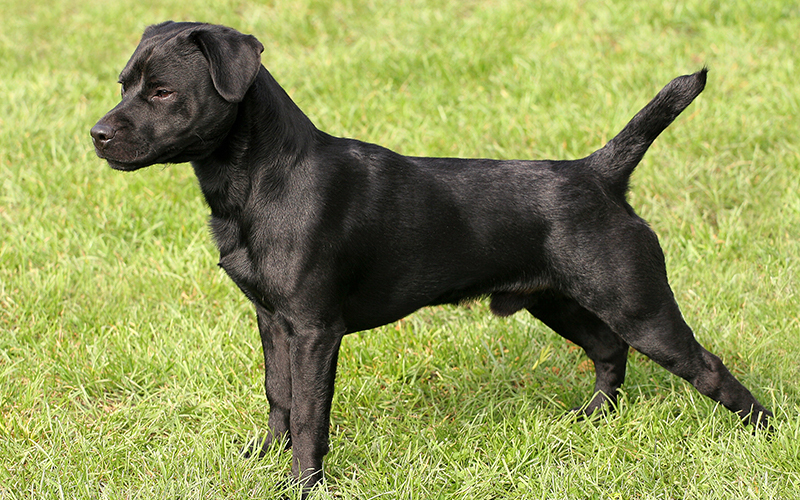 The Patterdale Terrier was bred almost exclusively for its ability to hunt. The dogs are descendants of several other Northern terrier breeds, and their origins can be traced back to the early 20th century to an early breeder named Joe Bowman. Unlike other terriers, the origins are quite clear and attributed to a single individual. Patterdale Terriers are a newer breed of dog and they are quite popular. These dogs are working dogs who focus on hunting, but they are far less “yappy” than other terriers. The Patterdale Terrier is quite small in size and weighs only between about 11 and 13 pounds, on average. While this is generally true, due to a large variation the dogs can weigh upwards of 30 pounds! While your veterinarian may have something to say about the heavier weight, the UKC does accept them as standard show dogs up to 30 pounds. These cute dogs are typically about 12 inches in height, but can stand up to about 15 inches if you have a taller pup. 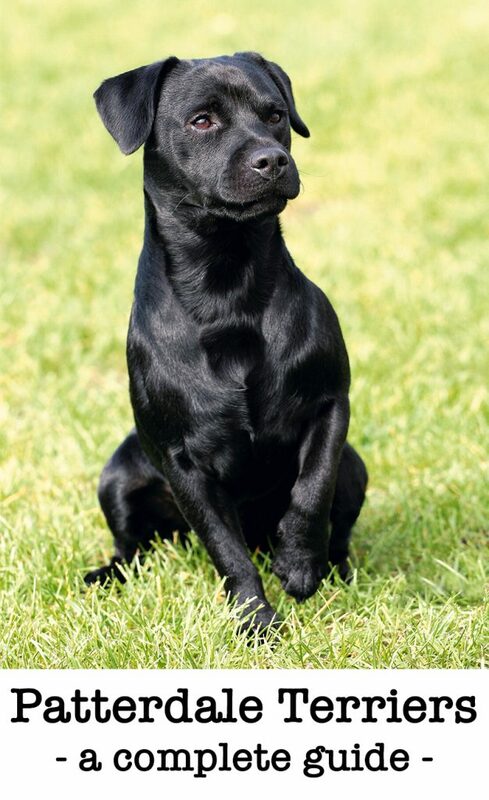 Patterdale Terriers have smaller heads with short muzzles, and their coats are black about 95% of the time. 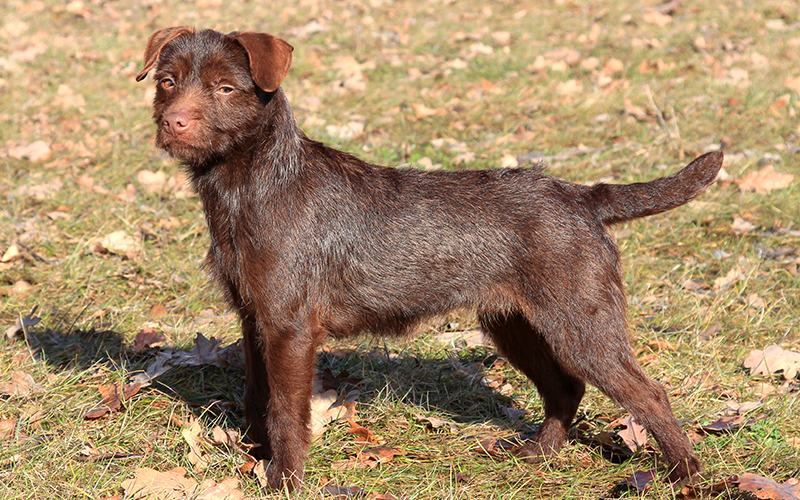 However, potential Patterdale Terrier colors include a bronze, red, liver, grizzle, or chocolate coat. Some white patches may be seen on the feet and chest as well, and this creates a unique color pattern that is quite desirable. The coats of the terriers are typically rough, broken, or smooth. A smooth coat is short and lies close to the body, while a broken coat is one with longer hair around the head, legs, body, or a combination of these areas. A rough coat is one with longer hair that is a bit more coarse and harsh. Patterdales have unique personalities that are both similar to and different from other types of terriers. Like other terriers, the dogs are confident, strong-willed, and lively. In some ways they are stubborn, but they can also be very biddable. These jolly pups have a lot of energy and enjoy playing, running, and fetching. Since they are a working breed, they are good at chasing and searching out toys, balls, and other objects. Most terriers are sweet dogs and Patterdales are no exception. However, you do need to make sure that the abundance of energy is exerted in a positive manner. Otherwise, your pup can become bored and destructive, which is very bad for your furniture and wardrobe. Although normally gentle, Patterdale Terriers can occasionally show guarding behaviors so it’s important to pick a puppy from friendly parents, and to socialize him thoroughly. Since Patterdale Terriers were bred as working and hunting dogs, they have strong instincts when it comes to hunting animals. The dogs were often used to locate foxes and rats, but they are highly adept at finding other animals as well, including raccoons. In fact, some terrier owners use their dogs to hunt raccoons. However, even if you are not the hunting type, your dog’s instincts can kick in if there is a raccoon nearby. Raccoons can and will attack dogs, and often with disastrous results. According to Dr. Eric Barchas from the San Mateo animal clinic, raccoons will sometimes attempt to drown dogs. They can also scratch the face and bite the abdomen, creating any number of serious injuries. You can prevent incidents fairly easily, since raccoons almost always attack at night, so keep your dog on a leash at all times when he potties in the evening, even if you live in an urban area. The strong will, stubbornness, energy, and hunting instincts of the Patterdale Terrier can make this dog a bit difficult to train. If you have ever had a terrier as a pet, then this might seem like quite the understatement. However, since Patterdales are a bit calmer and more low key than a Jack Russell or a Yorkshire, they are easier to train than these dogs. Training with positive reinforcement is advisable, and scientific research shows that this type of training results in fewer behavior problems down the road. 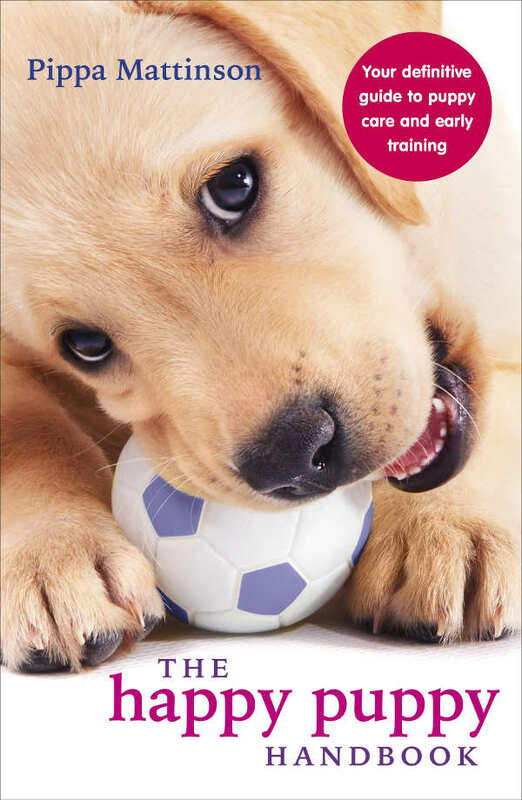 You can find out about positive reinforcement training here. If you are still deciding on the best dog for you, then you may want to know a little bit about the potential health problems associated with the Patterdale breed. This type of knowledge is important so you can assess the possible costs of owning your pet and so you can also examine your dog for potential problems. The good news is that the terriers have few health problems linked to their specific breed. Conjunctivitis and the formation of cataracts are two issues to watch out for though. Conjunctivitis, or pink eye, is an eye condition that involves the conjunctiva or the tissue that sits across the front part of the eye. This tissue can become inflamed and infected. Pink eye has several different causes including allergies, bacterial infections, and viruses. Patterdales will often develop allergies, so this is commonly the cause of the pink eye issue. Not only are seasonal allergies a concern, but skin allergies can develop too. If your pup has allergies, you may see some dermatitis developing across the body. The genetic predisposition to allergies and an overactive autoimmune system is sometimes called atopy, so speak to your veterinarian about this. Some Patterdales can also develop a disorder called portosystemic shunt or PSS. PSS forms when the blood meant to travel to the liver moves around the organ instead. This causes a lack of blood and a decrease in the nutrients and oxygen needed to function properly. PSS can be diagnosed through a blood test, so make sure that a liver panel is conducted during your canine’s yearly veterinary well visit. If a problem is detected, it can be treated with medication and diet. In some cases, surgery may be performed, but this is rare. Patterdales can develop knee issues, like most other terriers. The problem is called patellar luxation where the knee cap slips out of place. While the condition sounds awfully painful, it really is not. If the knee cap slips out of place, you may see your terrier kicking the leg to the side of the body. The patella will then shift back into position and you dog will walk normally again. While the issue may come and go, it should be addressed with your veterinarian. Some dogs need surgery to realign the knee cap so it stops slipping out of place. Patterdale terriers are a rare breed, especially since it is a relatively new one compared to other terriers. For example, the Jack Russell Terrier breed is well over 200 years old. Also, breeders are not as abundant in the United States as they are overseas. If you truly want a purebred Patterdale terrier, then breeders can be found in the United States. You should be prepared to travel some distance and to pay several thousand dollars for the pup though. If your budget does not allow for a purebred dog, then a rescue Patterdale may be a great choice for you. There are many terrier rescue groups throughout the country. To find a respectable organization, make sure the rescue is affiliated with the Patterdale Terrier Club of America (PTCA). Rescues often have older terriers for adoption. If you want a puppy, then you may need to adopt a mixed breed puppy. While Patterdales are excellent dogs for families, they can be a lot to handle in terms of their energy. Purebred terriers are ideal for homes with younger children who have just as much energy and enjoy small pets that the dog might well be a bit too keen on. If you are a single individual or if you have a quiet home with older kids, then a mixed terrier breed may be a much better choice. If you think this is a good idea, then look for terriers mixed with a calmer dog breed like a Spaniel, Bulldog, or Chin. Don’t be tempted to buy a Patterdale Terrier puppy, or any other puppy, from a pet store. Go to a breeder, who has an interest in the welfare of the mother. Make sure you meet the mother and if possible the father too. They should be in good condition, friendly and have an obvious bond with their owner. Patterdale terriers are wonderful, attractive, and energetic dogs that share a lot of the same traits as other types of terriers. However, the dogs have fewer health problems overall and are a bit on the calmer side, making them good pets for activefamilies. Do you have a Patterdale of your own and want to share some stories about your rambunctious pup? Let us know in the comments below! Picking your new best friend can be tricky. But you’re in luck! 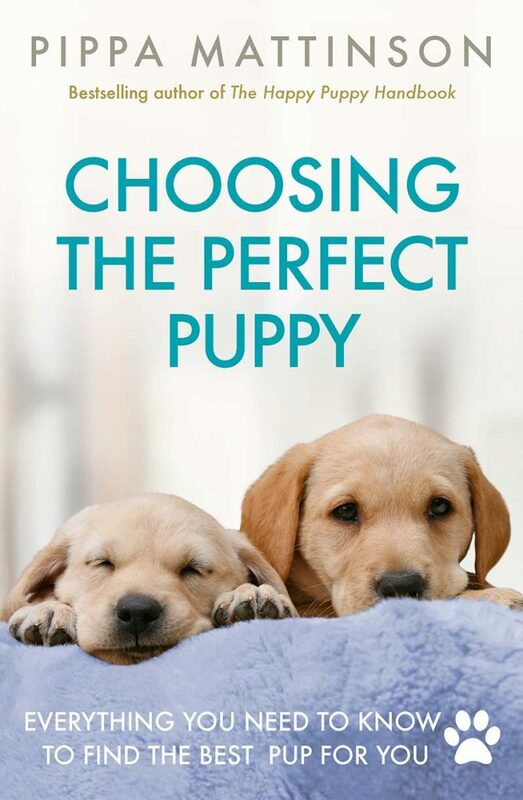 Choosing The Perfect Puppy is a great new book. Packed full of tips for deciding which breed to welcome into your home. Including detailed reviews of the most popular breeds. My baby was called Charlie he was a sweetheart. Loved to play but also loved to just relax and snuggle. He loved to sunbathe. Miss him everyday so much personality and love. He passed away from cancer nearly 2yrs ago. I’m so glad I have 12yrs of precious funny memories. I could write a book about our beloved Sage, a purebred Patterdale. We had 4 boys but one of them was Sage. He thought he was human and acted the part! He was housebroken as a pup immediately after one accident. He thought he had done a good deed when he brought me a parakeet he had caught (I bred tropical birds including parrots, and this one was an escape artist). One good scolding and Sage never looked at a feathered friend again….not even ducks at the pond. He may have been more intelligent than our 3 sons! He quickly learned to do tricks on command, played referee if he thought anyone was arguing, instinctively knew when any of us were having a bad day, and became well known and loved by all he met. His adventures became legendary in our community. Cant begin to relate all of the funny and heart warming stories here. He was as active as our boys. Patterdales are not your typical lapdog! That seriosly needs to be considered if you are contemplating obtaining a Patterdale, although he did slow down some in his older years. But if you can handle an active little dog, you will gain another member in your family that will not be ignored. We miss him terribly. My little Sonny boy is the most loving little guy. Wants to please his family and its very important to him to feel loved and accepted. If he goes unnoticed he gets down. Hates to be thought of as a dog, wont leave my side for a second even when he sleeps. He is so very special, he has a heart of gold and a personality that makes me laugh everyday. I don’t know what i would have done without his companionship. HE IS AND ALWAYS WILL BE MY BEST FRIEND! I absolutely love my Patterdale (Sally). She is such a loyal and loving girl. I lost my husband 2 years ago and she always senses my sadness and responds so quickly by jumping in my lap and to snuggle. Her intelligence and attention are amazing. My Jack is 14 years old. Unfortunately his arthritis and loss of vision are getting the best of him but I got him when he was 3 months old and he is the sweetest dog I’ve ever met not to mention smartest. He was so easy to train and only because of his age is he having accidents. I’m heartbroken that I’m going to be losing him soon and if it wasn’t for not being able to go through the heart ache again I’d get another patterdale in a heartbeat. He’s been my best friend for 14 years and has always been by my side. He was never mean or aggressive only sweet and smart. I love my Jack more than I like most people. I also have a jack and he is so loyal as well. I’m so sorry to hear of your heartbreak and the thought of losing your best friend..
We have a patterdale named Bo. We all just love him, most wonderfull dog in the world! Everyone should be so fortuned to have a Patterdale in the family. I just welcome home my patterdale terrier he only 5 month old. Someone gave him too us wow we got lucky did not know what breed it was cause I really did not want to question why he was giving it away. I just wanted to take him home. Little did I know he was pure patterdale terrier,I live in the Bronx and I haven seen one. So yes I was shock. We feel so bless for max to be part of our family. We live him. Just adopted a two year old, hoping to keep her. She is perfect with everyone and well trained. Our biggest problem is going to be breaking her of going after any and all animals. Yes even dogs. The only other thing is she needs to be broken of jumping up on everyone and the counter. We are trying the reward method to keep her attention when walking her. If she gets fixated on an animal she is hard to control. May use a mussel until she is fully trained. My Patterdale, now 30 months, has been dog aggressive since 12 months. The muzzle has been a great tool in sorting his aggressive behaviour. He cant bite, and has a chance to socialise. Charles is a cross with a Jack Russel, and has the energy for both. It has been three years now and we still have some issues with him jumping on guests. He get very excited to make new friends. Still he listens well, we just grab a ball first before answering the door. I have seen him jump 6 ft in the air nearly catching a pheasant in flight. If I can find a way I would love to train him to be a hunting dog. He is extremely athletic, hardy, and already behaved well enough for me to take him backpacking with no issues. Initially we spent many hours a day playing ball with him then started his obedience training after he let out a lot of energy. He does well on leash but is better off leash when he has a chance to run. Oh and he is better at volleyball than myself and is an excellent goalie. I would recommend to those who are having issues with this breed to try a “ball is life” approach, it has worked very well for us with Charles and others I know with the same breed. I have a patterdale cross dachshund, I’ve had him since 5 weeks old. He was a bit young when he came into my family with his brother which looked like a patterdale cross jack Russell. They were adorable but the trouble started with training. They always wanted to play together and not learn. The jack Russell cross badger was barking always at the neighbors and trying to jump my garden fences to chase cats, busy roads nearby, he never sat still, in the end I had to rehome him as having two dogs and four kids was too much for me. Also he would attack other dogs on walkie. The dachshund cross is quiter and calmer but he too has issues with protecting me, went camping and my daughter and myself were standing outside our tent when a member of our group came to say hi and he went for her nose, no harm came of that thank goodness. Also as a pup he played with all the other dogs, but soon as he went through a change he started attacking and being defensive around male dogs, the other males know my dog is unneutered and usually starts it first by growling or barking. He normally does it to dogs bigger than him. Makes me nervous to walk him. At home and around people he knows and female dogs he’s good as gold. Toilet training both dogs was easy. The dachshund cross loves my three cats, follows them around sniffing and cleaning their butts. Hes raw fed, nosode vaccination and treated holistically. Do you have any patterdales pups for sale? I had an adorable patterdale dog we rescued from Dogs Trust called Pepi. He was 5 at the time and we had him for a further 13 and a half years. He was the most stubborn dog I have ever known. But he was also the most loving and trusted dog I have had the pleasure of owning. He loved walking and spending time with me and my family. We are currently looking for a pup patterdale, because of our positive experiences with our beloved Pepi. If there is any advice I could offer to those looking to own a patterdale, it would be to train him to come to you at an early age. Otherwise you are destined for a dog on a leash for the most part. We have grandchildren who he just adored, he was a great companion and we miss his dreadfully. I adopted a 1 year old Patterdale mix about 1 and a half month ago and she’s (Nova) wonderful. We love her very much. She’s been good, a couple of accidents but nothing mayor, very obedient and loyal. But SHE CANNOT see a dog OMG she gets sooooo aggressive. She has some scars in her forehead, vet said she might had a bad experience. At the shelter they found her on the street, didn’t have collar and her paws were (still are) very dry and her nail all rogh. At first I was so scared because she was so aggressive to a Pitbull (without leash) and the pitbull ran to us I had to carry her. I’ve been taking her outside and sit/kneel next to her to keep her calm, I think is working. That the only down side. Other than that she’s an amazing a very active dog. My Patterdale, Raisen, is two & she is the best! I had labs before, but wanted something smaller – but she is by no means easier! I love her cuddles & kisses, she knows she makes me laugh- & does it all the more! She beats my 6yr old Scottie up – until he gives in & plays with her – they are too cute together. Yes she has been the hardest to toilet train – but now does weewees on command. She is greedy & will do anything for food, my house has become an obstacle course for her when she sees a fly, goes back & forth chasing it relentlessly!! She is my world! Hi. I have a patterdale and he has just started to do this. Barks and shows his teeth and looks aggressive and tries to bite hands. Shout no to him but makes him worse. So we have to try to.ignore him. Any suggestions and advice would be great too. Fly swatter is your fix! Love my Martha! Loyal, considerate, energetic and eager to learn every stupid dog trick I can YouTube! Potty training was rough, but that was expected bringing a little into our home. Excellent with kids and insists on being the life of the party when others are around. She helps me herd my flock in at dusk and even helps with the goats fearlessly. Stubborn when I am weak, but a truly great unexpected addition to our family. Bailey is 35 solid pounds. We are his fifth home. He was just over a year when I got him. He is afraid of big dogs, bicycles, skateboards, motorcycles. I am currently trying what I call the focus method. Lots of treats if he focuses on me instead of the things that we encounter that scare him. He is very protective of me, I have learned to never give attention to another dog in front of him, extremely jealous. We wanted a small dog that wasn’t wimpy so we got a Patterdale. She is the most darling, affectionate and goofy dog we’ve ever had. She loves my dirty socks and never damages them. She was however the most difficult dog to potty train, taking several weeks. She is fully potty trained now though, thank goodness. We keep her on leash anytime she’s outside as her high prey drive leads her chase any deer she sees. We have lost her a few times in the woods at the end of our neighborhood, scaring us half to death, but she always manages to make it back to our yard within the hour, dragging her muddy leash behind. She travels well in our cars, either in her crate or riding shotgun in her little dog bed. She does not like to go to bed, always angling to sleep in our bed instead, poor little lovable pup. I have always had cattle dogs until I fell in love with a friends Paterdale terrier. I tracked down the breeder in NSW and was able to meet Roger. He is chocolate broken coat. As he got out of my car in 10 seconds he killed 2 chickens. Roger was 10 months old when I got him, he wasn’t toilet trained. Initially I thought he might be deaf and or with poor eyesight because he was unresponsive.He is now trained. Lots and lots of positive reinforcement – he doesn’t attack small animals anymore although he knows where the echidnas are he isn’t obsessed with hunting them. He is absolutely wonderful such a happy fella he gets on with my kelpie pup and likes to spend time with his best mate Kieth a 70 kilo pig. I almost always have him on a leash when outside.unless we are playing. He came into his own when I first took him to the beach. I e stopped being surprised when he comes to his name. Unlike my “herding” dogs that are so obedient, Roger considers instruction before acting. Paterdales are fantastic and love close cuddles and seem to thrive on a instruction. The breeder was at Braidwood but now I think they are at Kempsey. Hi I felt like I needed to comment on this post, as I’ve never met a more loving dog than my patterdale Merle and more people should give these awesome doggos a chance. I’ve had him from being 8 weeks old, I was 23 when I got him and he is simply the best companion I could ever ask for in a dog. Against the reviews I read about needing experience with the breed and how hard they’re to train, I still took my chances on getting him. 18 months on and he is the best thing to embrace mine and everyone who meets him life. He does need a longer walk than a shiz tzu would but it keeps us both active and he loves exploring the outdoors. He has never barks at humans, unless he wants to warn us he needs the loo or sees someone coming down the drive and he has never once barked at a dog…he will only wimpers if they don’t want to play with him. His favourite things are cuddles and kisses, he is over the top affectionate, which I adore and he has the goofiest personality. He loves showing off his learnt tricks but he prefers it when that comes with a treat at the end of it. Don’t get me wrong he can be a tad stubborn at times, especially when it comes to going to the toilet before bed and it’s raining and he isn’t as daft as he can lead you to believe but that’s what makes his personality so great. If you’re thinking about getting a patt, do it! Best decision I’ve ever made, definitely the most underrated and fantastic bread out there. I adopted Maggie about 4 yrs ago as a small lab mix, she is 27lbs. I’m fairly certain now she is a Patterdale Terrier, possible mix as she has a thick tail. She is full of personality and quick to train. Love her regardless of her true breed but this does solve the question of what small dog she was mixed with to make a lab so tiny. Have just got a patterdale pup (Tess) who is now 12 weeks old and soon to go out on her first adventure after having her injection. She is smooth coat black with a small white blaze on her chest. She is already socialised towards people and especially children having been taken everywhere I go in her shoulder carrier so she gets used to all and everything, including visiting the local duck population and sea birds so she will be fine around smaller animals (seems to be working) She is coming along very well indeed with recall using the method in your book The Happy Puppy. I need her to be good around smaller animals and sheep as I am a photographer and she needs to come with me. Obviously she will be getting plenty of stimulation and excercise. All in all I think she is going to be just fine meant to add she is also great with dogs as she goes to our local vets puppy party. She even has her own Diary page on my website.